It’s dull and muggy today. The sky is a leaden grey and the air thick and yellow and almost unbreathable. After a leisurely breakfast Mary and I sat for a while on the top deck of the Commodore in comfortable padded chairs and chatted to some of our fellow passengers. Farewells and addresses were exchanged. Today we were all leaving the cruise ship, some of us to stay another week in Luxor, a few had already departed for a short break in Cairo while others were returning home on the flight to England this afternoon. Mary and I had eventually got our packing finished after breakfast and were ready to leave. The boat was berthed alongside the Sheraton Hotel at the southern end of Luxor which is quite a distance to walk into town. The view from here is peaceful, with the West Bank mountains just over the river and the lovely Sheraton gardens a stone’s throw away. 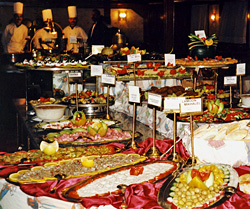 Lunch seemed to follow breakfast fairly quickly, a fabulous buffet as usual – I would certainly miss the meals aboard the Commodore – and then we were transferred by coach to the Novotel. This is the first time I’ve stayed in this hotel and our room feels huge and spacious after our small cramped cabin on the cruise ship. We are not directly overlooking the river from our balcony but have a corner room so we have a view of the hotel’s terraced gardens down to the Nile and the West Bank mountains as well as straight down the Corniche towards Luxor Temple. At least we should be able to see over the river but today the West Bank is shrouded in dusty clouds. After a week of very hot sunny days the notorious Khamsin has arrived. The Khamsin – literally the Arabic word for fifty – is an oppressively hot dry wind that blows south-easterly from the Sahara through Egypt, carrying with it large amounts of sand and dust and can last on and off for a period of around fifty days anytime between March and May. The wind, called ‘rih al khamsin’ by the Egyptians, is hated by them and in past centuries it was dreaded as a killer. The hot, zero-humidity atmosphere produced by the khamsin contains an excess of positive ions. It causes young people to feel overcharged with electricity which results in headaches, irritability and even violence, while older people react differently, becoming fatigued and depressed with low blood sugar which can cause different illnesses. It is a time when accidents are at their highest. Having experienced the Khamsin in Egypt a few times before I know this feeling. It always makes me feel depressed, so I suppose that puts me in the ‘older generation’ category. Mary and I spent the rest of the afternoon in our room in the Novotel, it was too hot and dusty to go out. In the early evening as the temperature cooled a little we walked the short distance to the Old Winter Palace and through the hotel’s beautiful gardens there where the perfumed air felt a little fresher. We watched the sun sink like a great orange bald head into the clouds. We had dinner at my old haunt the Amoun Restaurant and said hello to a few Egyptian friends who kept shops nearby. I bought a cheap wristwatch from Aboudi’s that had Arabic numerals on it’s face and a couple of books. Retail therapy! We were finally allowed off the boat when a coach arrived for us after breakfast this morning to take us to the Temple of Hathor at Dendera and we drove across the long bridge over the Nile and continued a few kilometres to the north, through fields of crops – a very rural Egypt here. When we were almost there we had a spectacular view across the fields to a temple that looked very dramatic rising from the flat plain. Dendera is one of the latest temples and probably the best preserved after Philae, although it was built over the site of several much earlier structures. Outside the huge mudbrick enclosure wall there are cemeteries from the Old and Middle Kingdom Periods. Dendera Temple is dedicated to Hathor, as well as her consort Horus and their son Ihy, but this is Hathor’s home, while Horus lived at Edfu – the temple further south that I had visited last week. At Edfu one of the most important annual festivals was the ‘Feast of the Beautiful Meeting’, in which the cult statue of Hathor travels from Dendera to Edfu to consummate the goddess’s ‘marriage’ to Horus. Here at Dendera the marriage hardly gets a mention and it is the birth of their son Ihy, the divine heir, which seems to be more important, especially during the Late Period. In earlier times it was the king or queen’s divine birth that was portrayed on temple walls but by the Late Period this theology had been transposed to the birth of the gods. In the later temples, Dendera, Esna, Edfu, Kom Ombo and Philae, the birth-houses or mammisi told the story of how the divine sons were conceived and born, depending on the place and the triad involved, but in each, the legend of the king’s birth is also prominent in the mix. The divine son’s father is both the king of the gods as well as the earthly king and it is usually the reigning king who welcomes the new-born child because he is spiritual heir to both the king and the god. It gets very confusing to work out what is going on. I spent most of my time today in the Ptolemaic and later Graeco-Roman birth-houses looking at the reliefs. The decorations in both the earlier and later mammisi depict the story of Hathor, Horus and their child – from courtship to the birth. One particular scene I love here is the formation of Ihy’s ka by Khnum on his potter’s wheel with Tauret the hippo-goddess and the frog-goddess Hekat waiting to take Hathor to her confinement. Next to the Ptolemaic mammisi is the sanatorium which also fascinates me and this has recently been undergoing restoration work so that several more low walls have appeared since my last visit here. The best overview of this structure is from the upper temple roof and I quickly sprinted up there to have a look – time was running short. 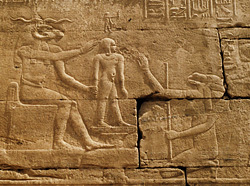 These sanatoria, which appeared in many of the larger temples, were not medical hospitals as the name suggests, but places of healing the mind and the only surviving sanatorium is at Dendera, which had a reputation for healing. With he help of priests the wisdom and compassion of Hathor was called upon in the small chambers around the sides of the building, where the sick and diseased would await the heavenly dreams that suggested a cure. This always makes me wonder what hallucinogenic drugs were used. As well as prophetic dreams, water cures were offered in the central part of the sanatorium. Here, water was poured over divine statues on pedestals covered in magical texts, collected into basins and drunk by the sick, or sometimes used for immersion. By lunchtime we were back on the Commodore and already heading back downriver to Luxor, a reverse of yesterday afternoon’s journey. Mary and I lounged on deck and I wrote up some notes while keeping an eye out for interesting scenes with one hand on my camera. I think this has been the hottest day so far. By dinner time we were back in Luxor and the evening’s entertainment had arrived. First was a belly dancer, who I thought was terrible but the male passengers seemed to enjoy. I usually love to watch Egyptian dance but I’ve seen much better than this lady and I was disappointed. 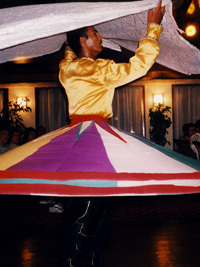 This act was followed by the dervish dancer who I’ve seen before and is brilliant to watch, spinning and twirling with his rainbow-coloured skirts swinging about him. It was very late when we got to bed and we haven’t even packed yet for tomorrow’s transfer to our hotel. Today was our group excursion around Aswan, in which we would see all of Aswan’s tourist attractions in five hours (!!?). I shudder to think that this is the usual amount time allotted to most people who visit the town as part of a cruise. But that’s just the way it has to be and at least it gives a flavour of the place, albeit a rushed one. We were on the coach and on our way to the High Dam by 8.00am. We drove onto the eastern end of the long dam past the Egyptian-Russian friendship monument, a modern concrete architectural sculpture called the ‘Lotus Tower’ that didn’t seem to bear any resemblance to a lotus to me. Our coach stopped in the middle of the dam and we were given the statistical facts and figures by a specialist guide. The Egyptians are very proud of this gigantic feat of engineering, the construction material used on the dam is said to equal that of 17 Great Pyramids. Aswan High Dam is a huge wall of rocks which captures the world’s longest river, the Nile, in the one of the world’s largest reservoirs, Lake Nasser. The first dam, in an endeavour to curb the annual Nile flood that had enabled agricultural fertilization for thousands of years, was built just to the north of here in 1889 and was subsequently raised several times as it could not cope with the volume of water coming down through Sudan from the Ethiopian highlands. In 1970 a new High Dam, called Saad el-Aali in Arabic, was completed after ten years work mostly with Russian funding and engineering expertise. 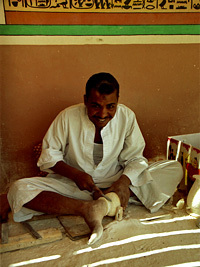 The benefits to Egypt in controlling the annual floods are said to have raised agricultural productivity by providing constant and much-needed water for irrigation as well as preventing damage to the flood plain, but the downside of this is in the ever-increasing use of chemical fertilizers by the farmers, which in turn causes a great deal of pollution. 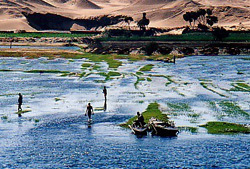 Meanwhile, down in the Nile Delta the land is slowly sinking because of erosion due to the decrease in river sediments. Although the construction of the High Dam has provided Egypt with a regulated 85% of its water, the ownership of the water itself is currently disputed by the countries it passes through before reaching the Egyptian border. Other benefits to Egypt include the provision of about a half of Egypt’s power supply from the dam’s hydro-electric station and it has also improved navigation along the river by keeping the water flow consistent. The 550km length of Lake Nasser holds 169 billion cubic metres of water and it was promise of this vast build-up of water that was responsible for the relocation of more than 90,000 Nubians, both Egyptian and Sudanese who had lived along the Nubian shores. It was not only the people who suffered, but the ancient monuments too had to be surveyed then relocated or removed before the land was flooded. The most famous of these was the Temple of Rameses II at Abu Simbel, which was taken down stone by stone and rebuilt on dryer land in what has to be the world’s most impressive archaeological rescue operation. 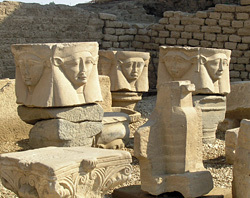 Under the auspices of UNESCO, twenty-four major Nubian monuments were salvaged and re-erected, with some of the lesser temples given as gifts to countries around the world who contributed to the scheme. One relocated temple, Kalabsha could be seen from the other side of the dam and with a long lens I managed to grab a few pictures. The Temple and other monuments on the site is due to be open to visitors soon we are promised. Another of the temples to be affected by the construction of the dam was our next port of call, the Philae Temple of Isis, now reconstructed on nearby Agilika Island. As I have already been to Philae several times before and time today was so short, I quickly detached myself from the group to take photographs and after their tour, Hala came and pointed out a couple of reliefs I hadn’t seen before. In a building next to the Nilometer is a relief depicting the source of the Nile and also an interesting scene about harvest and inundation. I rushed around the temple and the outer structures looking at things I wanted to see again but all to soon it was time to leave. The journey by boat to Philae is one of the nicest parts of a visit here and on the way back the boat took us around the island past the towering Trajan’s Kiosk – always a lovely view. The visit to the obligatory papyrus factory on the way back was at least a change from the perfume palaces I had previously seen in Aswan. We were back on the Commodore and I thought it would soon be time for lunch, but we were ushered straight out again with Hala for an hour’s trip around the islands in a motor boat. About 20 of us crowded into the large boat and we were speeded around the river to a musical accompaniment of drums and Nubian songs from the little crew, including that well-known old favourite, ‘O Aleyli…’. While this was good fun, I took a moment to gaze longingly at the lovely vista of the sand-covered Nobles tombs on the West Bank wishing there was time to visit them today. Then the motor-boat trip was over and we were all back on the cruise ship having lunch while the captain manoeuvred us out into the river to begin our return journey north back towards Luxor. The afternoon was restful and uneventful as we all lounged on the upper deck once more enjoying the slowly passing scenery presented on either bank of the river. Just as the sun was setting I got excited because I saw Gebel Silsela with its carved and quarried rock terraces high on the West Bank and rushed for my camera – but we had passed before I could get a picture. Another place I’d love to visit one day. We divided up the list between team members, each allocated certain tasks. You would not believe how difficult it is to find some of these items on a cruise ship. The ‘judges’ were made up of the captain and the three Egyptian tour leaders and after they’d managed to stop laughing they just had to award the first prize to the team who’d provided the best entertainment. But the ‘Eyes of Horus’ came second and we’d all had a hilarious time. The evening flew by and at Midnight we were passing once more through the lock at Esna. 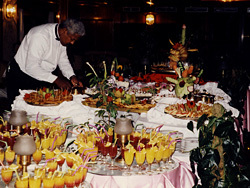 Our cruise ship the Commodore, was berthed on the east bank of the Nile next to a row of motor boats for hire. Today was scheduled as a free day in Aswan for us because some of the passengers had gone to Abu Simbel on a pre-dawn flight. On a previous cruise I’d been south to the Nubian temple of Rameses II and couldn’t again justify the cost of this extra trip for so little time there – merely and hour or two, though I would have loved to have gone. Over breakfast Mary and I discussed what we would like to do with our day. She wanted to go sailing in a felucca, but there was hardly any wind this bright still morning, unusual for Aswan, although it may pick up this afternoon I told her. A small group of passengers at our table were talking about going to a Nubian Village on the West Bank so Mary and I opted to join them. I suggested that we could perhaps call at the botanical gardens of Kitchener’s Island on the way as it was somewhere I had wanted to see and I went out and negotiated a motor boat with a captain called Ibrahim for the six of us. We motored through a narrow passage, between the massive rocks of Elephantine and the Old Cataract Hotel where my son Kit had almost crashed while sailing a felucca once. Soon we were pulling in to the quay of the small oval-shaped island that was given to Lord Horatio Kitchener in the 1890s for his part in the Sudanese campaigns, while he was the Egyptian Consul. A keen gardener, Kitchener constructed a botanical garden, importing many exotic plants and trees which flourished in the mild Aswan climate. Today, the island, which is now known as Plantation Island or by its Arabic name Geziret el-Nabatat, is a paradise of shade trees and vibrant exotic plants and I hoped we would get a glimpse of some of the colourful birds that are said to inhabit the island. It was a pleasant stroll along the neat paved paths that wound through well-tended plant beds. One of our group was a keen birdwatcher and he pointed out chiffchaffs and spectacled warblers, wheatears and shrikes – most of the birds he mentioned I’d never heard of. 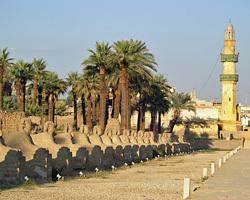 In 1928 the island, under the Ministry of Irrigation, was turned into an experimental station for plants from equatorial regions and alongside the native trees and plants of Aswan such as the sycamore fig and the date palm, many trees were brought from abroad and cultivated for use in the timber industry. Experimental oil and fruit crops were also propagated on the island by the Ministry of Agriculture. The island is now owned by the Egyptian government and there is still a biological research station at its southern end which is not open to visitors. We walked as far as we could go, to where a little cafeteria overlooked the water, but we had no time to stay as our Captain Ibrahim waited with our boat to take us further downriver. The village of Nag’ Seheil Gharb is as its name suggests, just to the west of Seheil Island towards the First Cataract. As Ibrahim piloted us through the river he carried on the ornithology lesson by pointing out hoopoes, night herons, a black kite, kingfishers diving for fish and the inevitable white egrets. On this part of the river a huge volume of water bubbles boils and churns over rocks that have been carved over time into wonderful shapes, towards the once-treacherous cataracts at the old dam. We were met on the bank by a hoard of children who grabbed at our hands and our clothes and dragged us up the steep dunes towards the village. They all had something to sell of course and most were toting large baskets of wooden dolls and camels they had made, Nubian crochet hats, bright cotton scarves and even tiny mummified crocodiles. In the village itself narrow alleyways with a scattering of goats wound between beautifully decorated houses, dazzling white or multi-coloured in the morning sun. I was surprised at how clean it all looked. Doorways and windows were framed by typical Nubian painting – geometric patterns and colourful shapes that added glamour to the tiny houses. A self-appointed guide soon attached himself to us and after we all declined a camel ride, he insisted we went for a drink in a ‘typical Nubian house’ – obviously one kept for the purpose of visiting tourists. What did we have to lose (except money) and most of us were curious to see inside one of the pretty houses. The house he took us to was quite large with a sandy courtyard lined with stone mastaba benches covered in colourful striped woven rugs. Someone went off to make our tea and while we waited several of us got into the spirit of the visit by agreeing to (rather reluctantly on my part) have henna tattoos. We were assured that they were not permanent, lasting only a week or two and they were very well done. Mine was an intertwining of flowers and vines on my ankle and looked quite attractive, but was something I would never dream of having at home. All of this took rather a long time, but as we went back out into the street the little crowd of children were still waiting patiently with their baskets of goodies and a few of our party gave in and bought some of the toys. The mummified baby crocodiles had no takers! We were back on the Commodore for in time for lunch, the journey home being much quicker as we were motoring with the current rather than against it, around the more direct western side of Elephantine Island. Mary still wanted her felucca trip, so before going back on board we arranged a sailing boat to Elephantine for the afternoon, which satisfied both of us. I had never had time to get to the island before, so the combination of a restful afternoon sail along with a quick tour of the monuments was perfect. 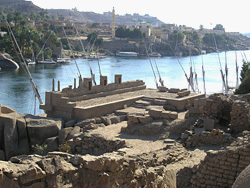 The early afternoon sun was scorching on Elephantine. A guide showed us around the monument area, which included the largest surviving structure, the Temple of the ram-headed creator-god Khnum, at the southern end of the island, which dates from New Kingdom to Roman times. 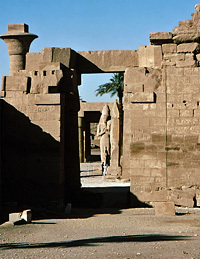 A granite gateway built by Alexander is the only large structure of the temple remaining intact and the jumbles mass of ruins behind it are difficult to identify due to ongoing excavation. At the front of the temple, which is oriented east to west, a restored pavement surrounds fragmentary remains of columns built by Rameses II. This leads down to a Roman quay that overlooks the river. Further north, behind the museum building there is the site of a small restored Temple of the goddess Satis, the consort of Khnum, built in the time of Hatshepsut and Tuthmose III. The reconstruction here by the German Archaeological Institute has been sensitively done, with the few remaining reliefs supplemented by drawings and I thought the delicate colourful paintings in this temple were beautiful. The temple was built over Middle Kingdom remains beneath different floor levels as well as a Dynasty VI temple. The latest structure to emerge from the excavations at the Satis Temple is an Early Dynastic shrine which we saw in a crypt-like area below the reconstructed temple. It was a little flooded by water and very dark, but it intrigued me as this must be one of the earliest remaining shrines in Egypt. Probably one of the most popular structures on the island, just in front of the museum, is the nilometer. This was one of the earliest known nilometers and was used by the ancient Egyptians to measure the height of the Nile floods in order to forecast the level of inundation and so gauge taxes for the coming harvest. Ninety steps lead steeply down to the river from the entrance. When we had finished the tour our guide invited us to join him in a glass of tea under the shade of a trellis, which we gratefully accepted on this hot day. Finally we visited the museum, a rather dark and dingy set of rooms that I thought could do with a good clean, but there were some very nice objects there. Eventually we were back on the felucca, sailing on the river and trying to catch a glimpse of the many boulder inscriptions naming the kings and governors who have been associated with Elephantine, once the Egyptian frontier to Nubia. During our return journey our ebony-skinned captain chatted with us about Aswan being Nubian, not Egyptian and it certainly feels that way. There is an easy-going atmosphere to the place that is apparent in the gentle breeze, the light-hearted way these people treat tourists and the ever-present reggae music that was softly playing from a cassette deck on the boat. Back on the Commodore once more, we had a couple of hours before dinner so Mary and I decided to take a caleche to the suq, now that the day was cooling down. After dinner, our Nubian day was continued with great local music and dancing (by members of the crew) and entertainment by a ‘witchdoctor’. What a beautiful morning to wake up in Edfu, where we had docked at some time during the night. The low sun was casting pale glittering shadows on the river as we went down to breakfast. It wasn’t quite such an early start as yesterday but we had left the boat by 8.00am for the short coach ride through the busy town of Edfu to the Temple of Horus. I’ve visited Edfu Temple several times before but today I was surprised by how quiet it was. We parked in the street alongside the stalls selling galabeyas and souvenirs and walked along the western side of the long temple enclosure wall, past rows and rows of larger-than-life Ptolemaic kings offering to various deities and then around to the huge First Pylon. To my amazement the courtyard was empty and so was the temple – our little group were the only visitors this morning. I stayed with Hala and the other guide for a while before setting off to take pictures, a temple devoid of the hoards was an opportunity not to be missed. While Mary stuck with the group, I went to photograph the eastern staircase. I was hoping to find a guard who might let me go up onto the roof. I soon found a willing enough guard, but unfortunately he didn’t have the key to the locked gate at the top, I guess it’s a no-go area. But the staircase was interesting and very similar to the dark winding stairs at Dendera, with priests and standard-bearers processing up and down. 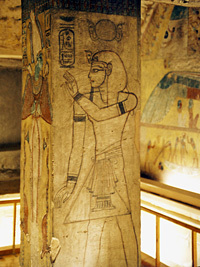 The ‘Pure Place’, a kiosk-like shrine to Hathor at the bottom of the stairs in an open ‘sun court’, is also identical to the one at Dendera, with the same figure of the sky goddess Nut on the ceiling. In many respects this is Dendera’s twin temple, this being the abode of Horus, while Dendera belonged to his consort Hathor. The cult statue of the goddess was brought here each year by river to join with hubby to celebrate the ‘Feast of the Beautiful meeting’. Scenes of this important annual festival are shown in great detail inside the porticos of the courtyard, but there was not enough time today to study these reliefs. I caught up with the group while they were in the sanctuary and then it was time to leave. I would dearly have liked a few more hours here – I had intended to have a good look at the Roman mamissi, on which the mamissi at Dendera was modelled but there was no time. This is a drawback in doing a cruise. It gives the visitor a taste of ancient Egyptian archaeology but you really need a separate visit to see much more. By 10.30am we were back on the boat on our way to Kom Ombo. The weather has been much warmer today and Mary and I sat on the boat’s top deck in the shade in the afternoon watching river scenes. My friend dozed on a sun lounger while I jumped up and down taking photographs of the odd clump of drifting water hyacinth, a heron on the river bank or a tiny island populated by the ubiquitous white egrets, but it was very peaceful. By the time we reached Kom Ombo the sun was already low and our visit to the temple, high on its promontory on a bend in the river, was quite rushed. It was almost dark when we left, running the gauntlet of souvenir stalls whose owners were desperate to compete for the last of the day’s sales. Many of the cruise passengers bought galabeyas and head-wear for tonight’s ‘galabeya party’ but I have brought an old favourite with me from my collection at home. As we were steaming away from Kom Ombo I stood on the rear deck watching the beautiful spectacle of the temple, floodlit now and standing gracefully to await tomorrow’s new consignment of visitors. The galabeya party after dinner was fun, with everyone dressed up and getting into the spirit of things. Some of my fellow passengers are real characters, stealing the show with their outrageous antics. We arrived and docked at Aswan around 10.30pm but I don’t think anyone noticed we had stopped until much later. We overslept this morning and after a very rushed breakfast Mary and I dashed out to the Corniche to board the coach at 7.00am for the first of our excursions. It seemed like the sun had also overslept – the weather was grey and windy and disappointing for our first day in Egypt. The cruise passengers were divided up into three groups of about a dozen, each with our own Egyptian guide. Our guide is Hala, an Egyptologist who is taking time off from her regular job at a university in Cairo. 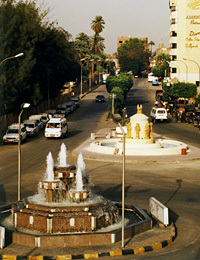 As the coach wound its way through the wakening streets of Luxor towards the bridge and the West Bank, we were given a brief history of Thebes and the monuments we would see today, in that witty way that guides have in an attempt to break the ice, trying to get their charges to interact. By the time we reached our first destination, the Valley of the Kings, the ice had broken and we were all properly awake, including the sun that had at last appeared above the bank of cloud bringing with it a pleasant warmth. I’m not used to going to the Valley at this time of day, preferring the quiet of the afternoon when most of the tourists have gone, but although it was very crowded it felt great to be back as we all trooped up the road from the coach park between the high sandstone cliffs that enclose this sacred necropolis. As the Valley widened out the crowds dispersed and the familiar silence, unique to this place, enveloped me. I had dreamed of visiting the Valley of the Kings since I was a young child and since my first encounter with it in 1995 and many more hours spent here, the place has become very familiar. I felt like I knew every inch of every tomb like old friends. It was a different experience visiting the royal tombs with a guide and a group. We went into the tomb of Rameses IX (KV6), the first tomb the visitor reaches when entering the Valley. This wouldn’t have been my first choice, the decoration is quite late and well developed and rather bemusing if you haven’t seen any of the other tombs that show the way the decoration evolved, but at least the access is easy and not to strenuous for starters. As we walked down the wide corridors past walls decorated with extracts from the ‘Book of Gates’ , the ‘Litanies of Re’, the ‘Book of Caverns’ and the ‘Amduat’, Hala did her best to give a commentary but she had to shout to compete with several other guides speaking in different languages. It was like being in the Tower of Babel! One of the most beautiful parts of this tomb is the vaulted astronomical ceiling in the burial chamber which has a famous double representation of the goddess Nut who swallows the sun each night and gives birth to it again each morning. Afterwards, Mary and I set off on our own to visit the tomb of Seti II (KV15), which was left unfinished but with some beautiful reliefs and the tomb of Tawosret / Sethnakht (KV14) with it’s delicate paintings in the corridors and the king’s huge granite sarcophagus in the burial chamber. At least these last two tombs were not crowded, in fact we had Tawosret’s tomb to ourselves – which was my reason for choosing it this morning. I took a lot of photographs but it was quite dark, so I’m not optimistic that they will come out. I had a quick look at the ATP (Amarna Tombs Project) excavations – but the team were not here and the excavations covered over. I did notice a new wooden bridge that had been built over part of the road covering the excavations. After the Valley we stopped at the inevitable alabaster ‘factory’ and while my fellow passenger admired the translucent vases and colourful statues (which are not produced here at all) and watched a demonstration by a suitably dusty stone carver, I had a chat with Hala, who I was beginning to see as a guide worth listening to. It’s nice to see a female Egyptologist (a rare breed) and she is rather a serious person. Not at all like my previous experience of guides who prefer to impart jokes rather than information. I could see that we would get along very well. Hatshepsut’s Temple at Deir el-Bahri was our next stop – the queen re-named ‘Hot-chicken-soup’ by the only male guide! Ha-ha yawn… Here I detached myself from the group and sped up to the third terrace which was now officially open after its years of total rebuild. I spent all my time taking photographs of the scenes of the Valley Festival which adorn the walls of this terrace but was a little disappointed to find that the side-chambers were still off-limits. I’ve been very fortunate to have a private view of the third terrace on a previous occasion as the guest of an antiquities inspector, so I really couldn’t complain. I must say it’s looking good with the colourful reliefs very well-restored. By 12.00pm the sun was burning down on us in the bay of cliffs that surround Hatshepsut’s temple and it was time for all sensible tourists to head home. Our last brief stop was at the Colossi of Memnon, the two giant statues of Amenhotep III which once graced the entrance to his mortuary temple. The sun was at a totally wrong angle for decent photographs and I chuckled to myself as I remembered my last visit here a couple of years ago – a Midnight expedition with my friend Jenny and tea with the tourist police who were on guard that night. We were back on the boat in time for lunch and immediately ‘set sail’ for Esna, the next big town on the Nile going south. We had a lazy afternoon on deck watching the activity on the banks of the river as the boat steamed past tiny villages, unchanged since the days of ancient Egypt. A strong wind made the air decidedly cool and I watched a few brave people splashing about in the tiny pool determined to enjoy their holiday in the sun. By 7.00pm we were moving through Esna lock, where the boats are lifted up to the next level of the river. Boys in little canoe-like craft drifted around our ship shouting at us to buy souvenirs which they would throw up to the passengers on deck and hope that in return, money would find its way back down. A strange way to do business. Before dinner we had the ‘Manager’s cocktail party’ with an array of precariously stacked vibrant glasses of drinks in every colour – a real spectacle. We had docked in Esna town during dinner, but we were one of a row of several cruise-boats and we were discouraged from going ashore.